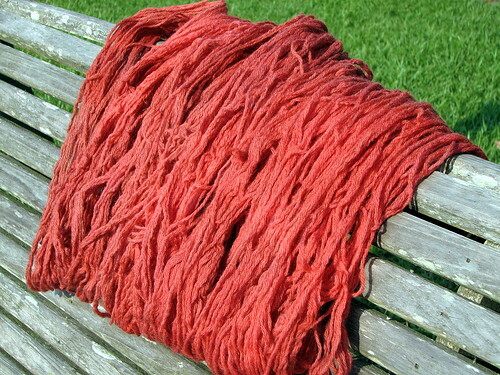 more Kool-aid dyed yarn - I love this batch! We're waiting on Gustav, and we're ready. We don't plan to evacuate, but we may ride out the storm at my SIL's house, mostly for the company. We'll probably not have electricity for a while, so things may be quiet around here. Thank you all for your thoughts and prayers - they're much appreciated! I have to admit, not much has been done on scrap quilt #2. I'm a little burnt out on quilts, so I've moved on to something new. 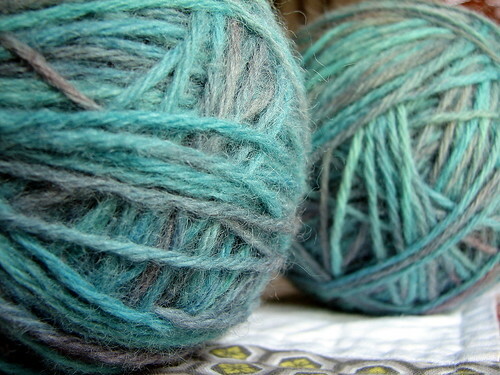 Last night I tried my hand at dying yarn. It was so much fun! Of course, most of the fun was the company. I was able to meet and hang out with two local knitters I found through Ravelry. How cool is that? They suggested we try our hand at dying on our first meeting. I didn't have a clue, but it seemed interesting. We all tried a different method - Shannon used jacquard dyes on a sock blank in a super cool tiger stripe design, Lynn used Kool Aid that she mixed up and layered on, and I used Kool Aid that I just threw in the bowl and nuked in the microwave. Oh yeah, there were also cosmos. So much fun (too bad I forgot my camera)!! 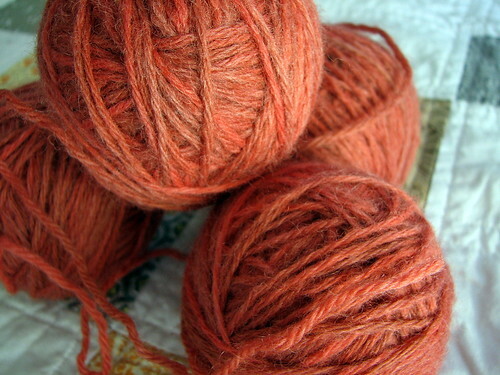 So, not only did I end up with some cool new yarn, I also made two pretty cool new friends. I can't wait to get together again - we all have our fingers crossed that we still have houses next week. Thank you for all the quilt love!! You sure know how to make a girl feel good ;-) I'm so happy you all like it as much as I do. That quilt is going to be a tough act to follow, but I've already started thinking about the next one. Since the scrappy quilt has been made, Alex has been sleeping with it. Well, you know how siblings are - this made a big sister very jealous. They both want to sleep with a momma made quilt, so last night Lily slept with my table quilt. 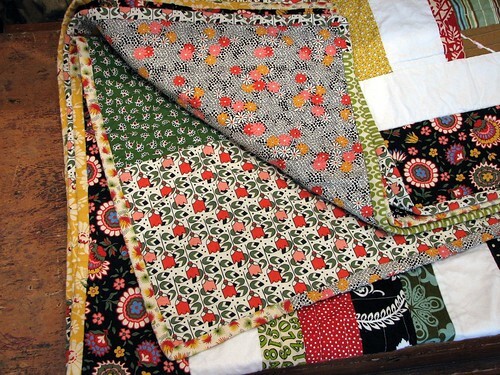 This is all fine and dandy, but I like my table quilt on my table! 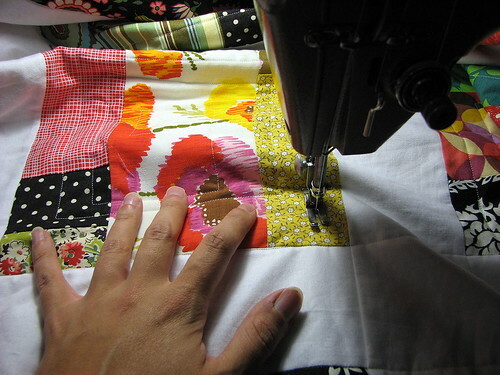 I have no other choice but to make another quilt - pronto!! Working on this next quilt will be a nice diversion as we anxiously wait to see what Gustav will do (I hate hurricane season). What can I say? 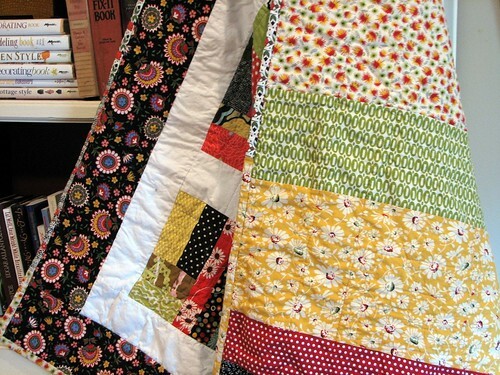 I'm a girl obsessed - with this quilt, that is!! Thanks to a stomach bug and a day on the sofa, I finished sewing on the binding. I was ready to photograph and blog about it the second I sewed the last stitch, but I knew I knew I needed to pop it in the wash first - love that wrinkley goodness. I went with a pieced binding, using left over pieces fom the back. Oh yes, the back! I think I love it just as much as the front. Thanks to Fay, today was a wet, wet day. So what did I do? I cooked lots of food and sewed. Richelle and I bonded. Oh my, I love that machine! It never occurred to me to quilt on her before, but I'm glad I gave her a shot. Her long arm was especially helpful. Quilting this quilt wasn't nearly the workout as my last one. I think Richelle's power and speed had everything to do with it. The fabric just flew through this machine. 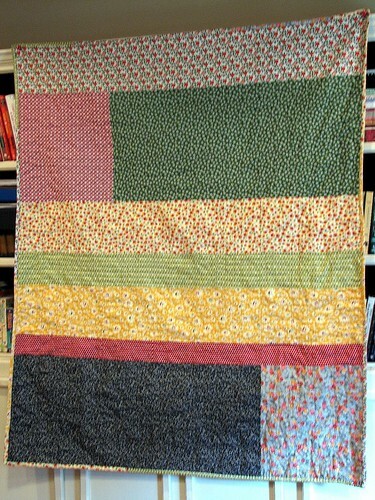 I didn't start quilting with a plan, but after sewing a few lines I decided to do spiral sort of pattern on each block. I LOVE how this turned out. 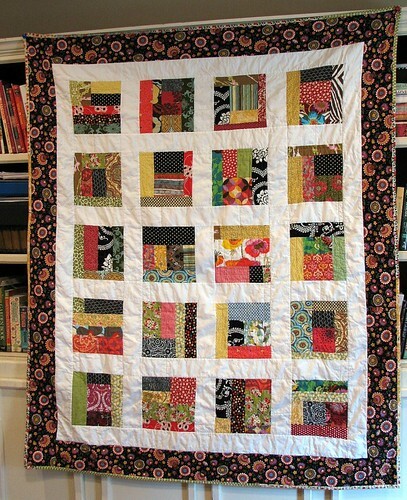 I can't tell you how in love I am with this quilt!!! I ended up getting way more accomplished than I set out to do - I'm already at the binding. 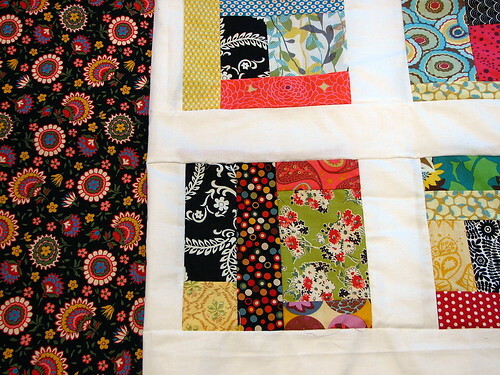 In a few days I'm sure I'll have a finished quilt - yippie!! Man, I'm tired! 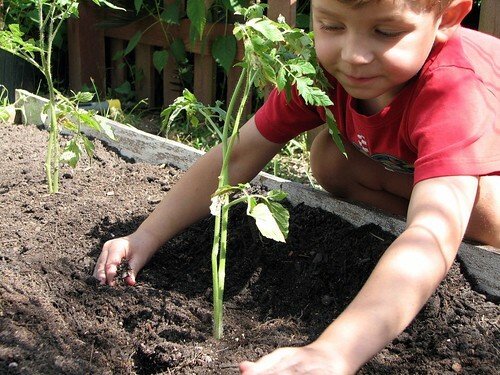 I just spend some time prepping and planting my fall garden. It was long over due. I planned on doing this a few weeks ago, but it's been too hot and I've been too tired. It's still extremely hot, but I couldn't let any more time pass. 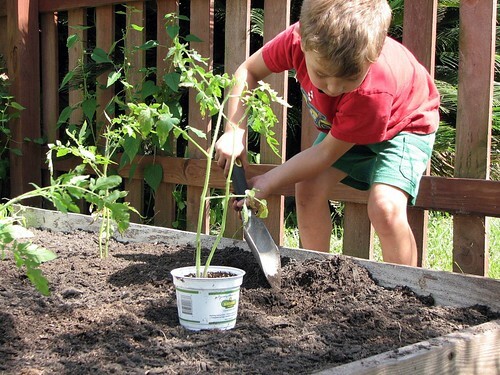 I'm only planting 4 tomato plants and 2 cucumber plants. It was slim pickings at the nursery. I have my fingers crossed that these do a little something. Perhaps having a special helper will do the trick. 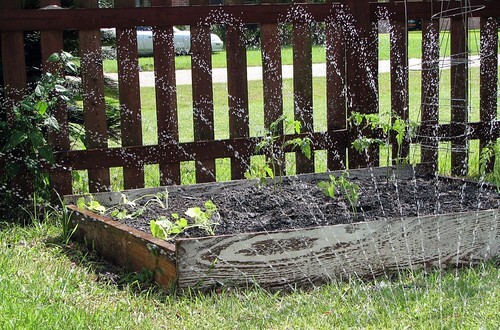 This little garden gave us such pleasure this spring, I can't wait to see what the fall will bring! I got nothing. My sewing maching is in the shop. They told me it would be 7 business days, so that puts me getting it back at the end of next week. Yes, I still have Richelle to sew on, but getting to her isn't so easy. 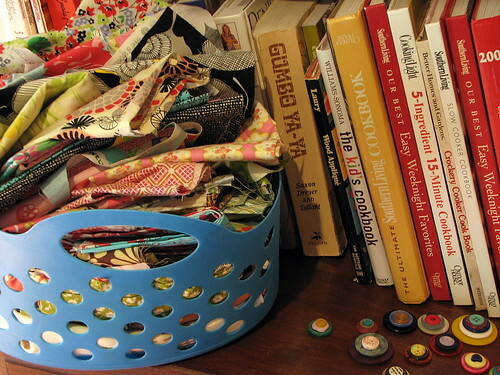 At the moment, my sewing room is mostly my fabric storage room. My broken sewing machine let me sew in the kitchen, right in the middle of our family hustle and bustle. It's not so easy to sneak off all by myself to the sewing room. These days, by the time I can go up there to sew, I'm too tired to make the effort. And now that I've begun my love affair with knitting, I'd rather lay in bed and knit instead. I do have some new ideas in my head that I'd like to try out. Lily needs a new bag for her dancing gear, so that needs to be made. I'd also like to make a few fallish bags for the shop, maybe try out some new designs. I don't know. There always seems to be so many ideas with so little time to execute them! 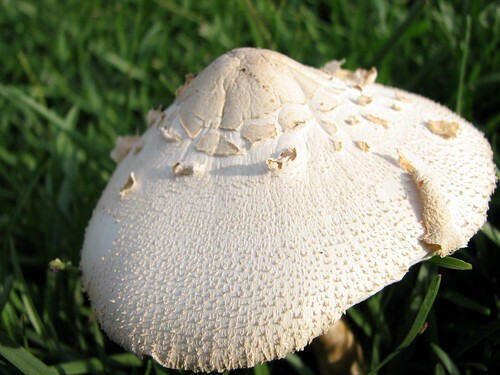 That mushroom has absolutely nothing to do with this post, I just thought it looked neat. After much hemming and hawing I've decided to make and sell some bag patterns. Eeek!! 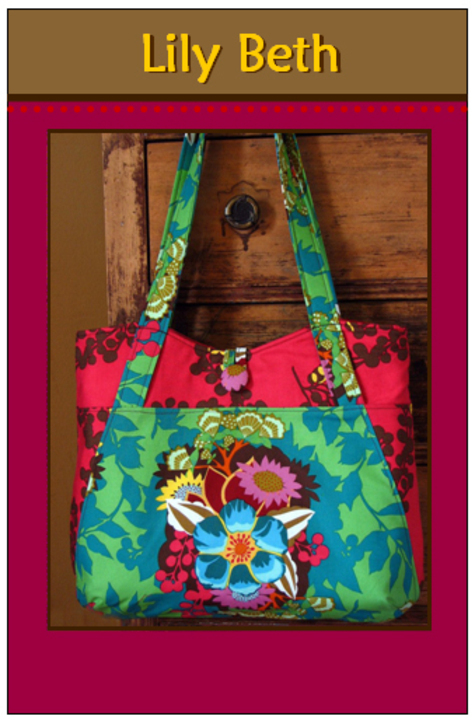 First up is the Lily Beth tote pattern. This pattern is available in PDF, so when purchased, it will be emailed to your in-box. All the pattern pieces fit on regular 8.5 X 11 paper to be printed on your home printer, with minimal taping. The only pattern piece I didn't include is the strap, which I give the measurements for instead. I figured you might not want to waste all that paper and do all that taping for a long skinny rectangle, but I could be wrong - let me know. As it is, the pattern is 10 pages long. The cost is $8. I'm a low budget operation, so if you want one email me at artsycraftybabe (at) gmail.com. I'll then send you a pay-pal invoice, you pay, then I'll email it to you. I'm on the computer quite a bit, so you should receive your pattern in less than 24 hours. Depending on the response, this process might change. Shoot, this is all new territory to me!! My scrappy quilt top is almost done. This weekend I was able to finished up my blocks and add the sashing. I wasn't sure how I'd like the white, but I'm glad that I used it. I was going to use a color for the sashing, but then I never made it to the fabric store and white was what I had on hand. I like how it lightens the quilt up. I still need to add a border. I've decided that the black floral is perfect, but I don't have enough of it. I suppose I could use a narrower border, but I don't want to. So, after looking around for a substitute and not finding anything, I ordered some more. I'll be putting this on hold until that fabric arrives at my doorstep. Of course, I still need to find something for the binding and the backing. I'm pretty sure I'm going to use something from my stash for that (goodness knows I have enough!). This is exciting - it's all coming together!! And now it's Monday. The countdown to the weekend begins.